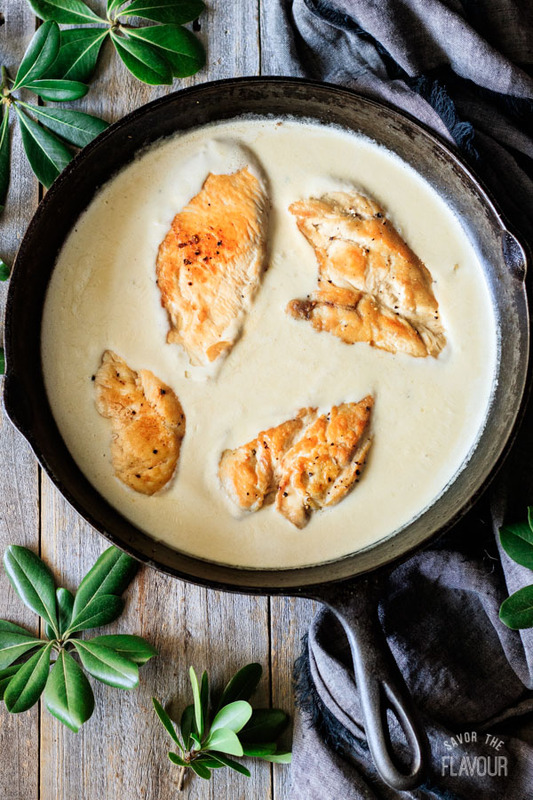 Creamy lemon chicken is an easy low carb recipe that is quickly cooked in a skillet. 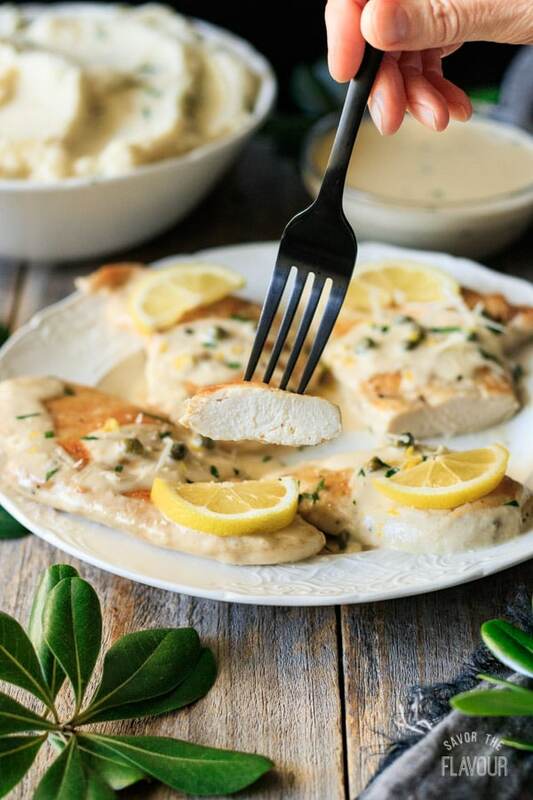 The creamy lemon sauce is simple to make with capers, garlic, Parmesan cheese, and real cream. Serve this tasty meal for your family’s dinner tonight. It’s delish, and oh so lemony! 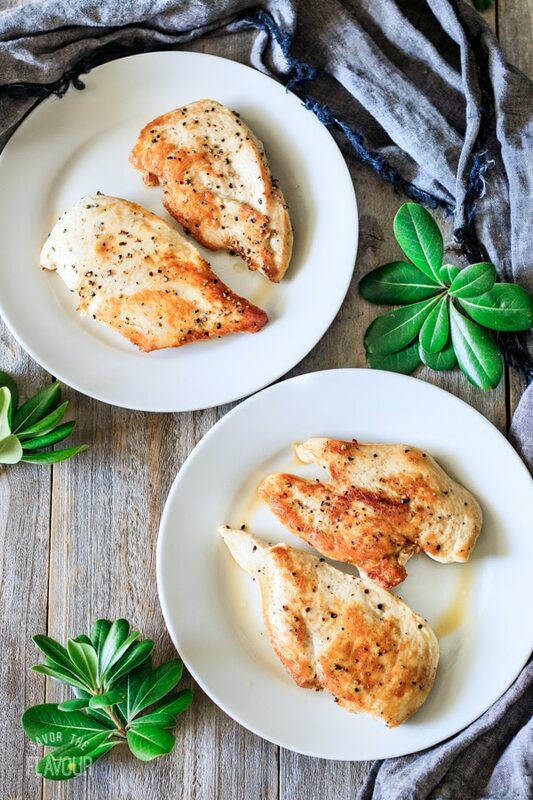 If you’re looking for a low carb chicken recipe, we’ve got you covered. 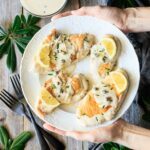 This creamy lemon chicken is a recipe that can be proudly served to your family in under one hour. It’s an easy gourmet dish that is super delish. What goes with lemon chicken? 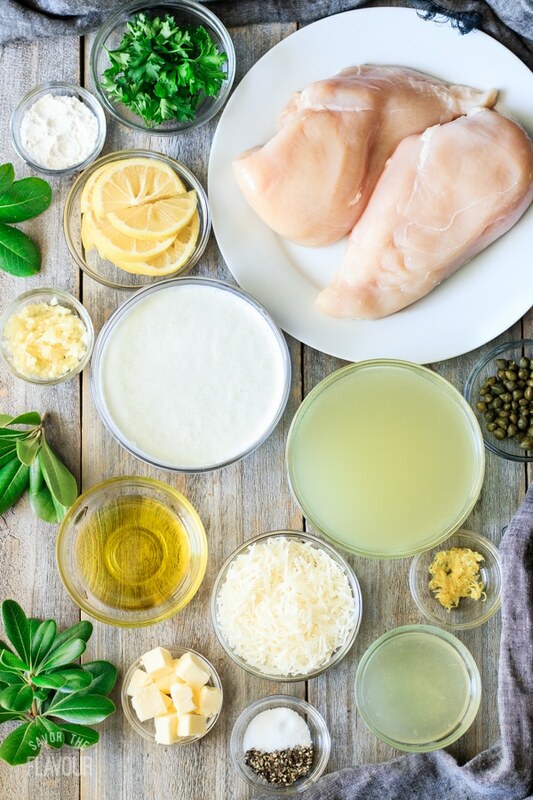 Try these ideas to round out your meal of lemon chicken. Gather all the ingredients. Zest, juice, and slice lemons. Measure out the liquid ingredients. Mince the garlic, grate the Parmesan cheese, chop the parsley, and cut up the butter into cubes. Rinse and pat dry the two large chicken breasts. Cut the chicken in half horizontally, cover with plastic wrap, and pound thin with meat mallet. Transfer to two plates and sprinkle with salt and black pepper. Heat the olive oil in a large skillet and cook the chicken for 5 minutes each side. Transfer the chicken to clean plates and set aside. Saute the garlic until fragrant, then deglaze the pan with chicken stock, scraping up any browned bits with a wooden turner. Decrease the heat to medium and add the cream, lemon juice, capers, and cheese. Sprinkle with salt and pepper. Bring to a gentle simmer and cook for a few minutes, whisking occasionally. Make the beurre manié (pronounced burr man-YAY) by combining equal parts softened butter with flour. Mix together with a fork. Add the beurre manié, one small spoonful at a time. Whisk and repeat until it is the desired thickness. Whisk in the lemon zest and juices left from the plate of chicken. Return the chicken to the skillet to heat through. Garnish with freshly grated Parmesan cheese, chopped fresh parsley and lemon slices. 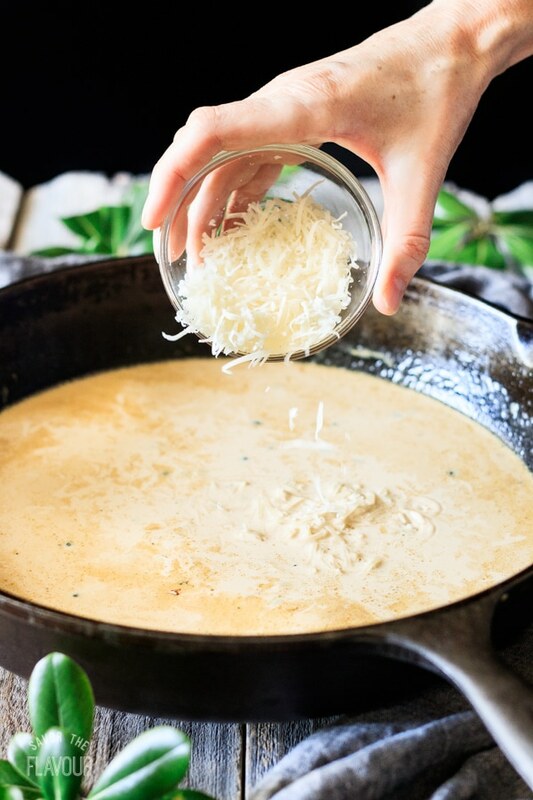 Use freshly grated Parmesan cheese for the best flavor. On a diet? 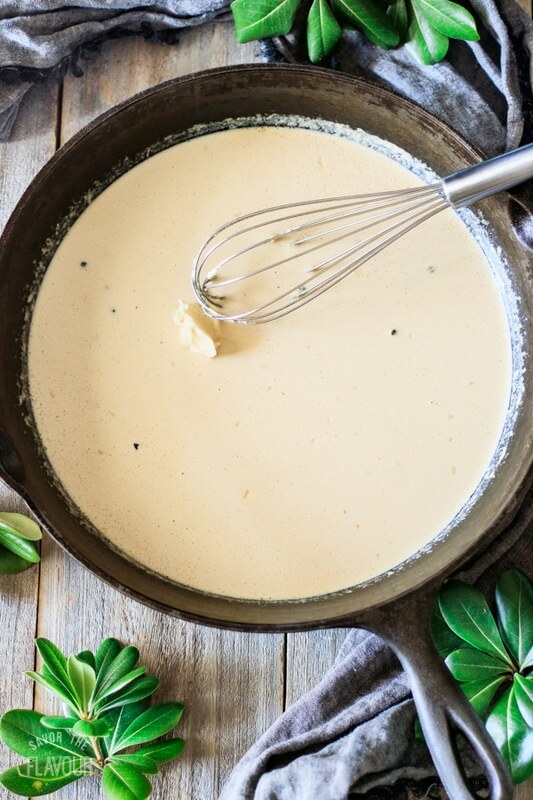 Use half and half instead of heavy cream. Like it extra lemony? Use lemon juice, zest, and slices to increase the lemon flavor. Have leftover lemon sauce? Cool before refrigerating and serve it later on pasta or mashed potatoes. Creamy lemon chicken is a simple recipe that very low in carbs. It’s quick and company worthy. Try it tonight. If you’re a fan of lemon chicken, you won’t be disappointed! These other chicken dinner recipes will satisfy hungry tummies. 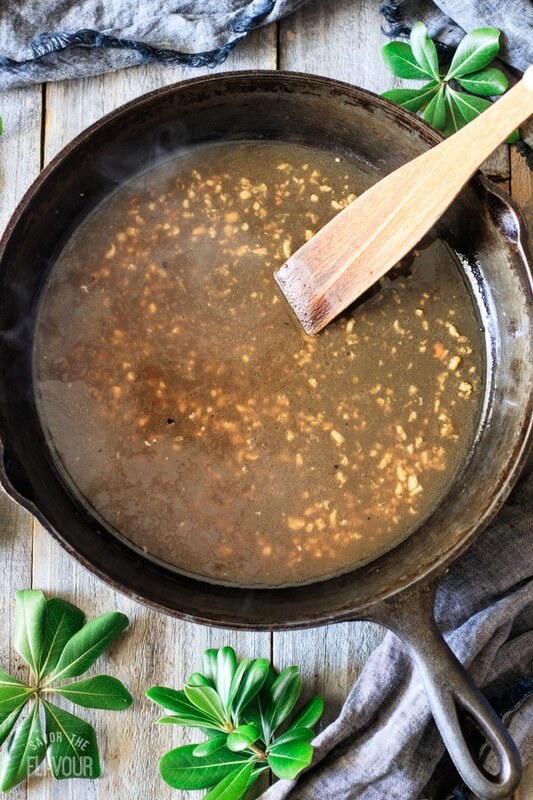 Southern Smothered Chicken: cook the most succulent chicken you’ll ever have along with a rich gravy. 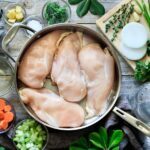 How to Poach Chicken Breasts: this simple cooking technique will help you make the perfect chicken salad. 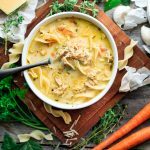 Creamy Chicken Noodle Soup: a hearty comfort food that is just the thing to enjoy on a cold day. 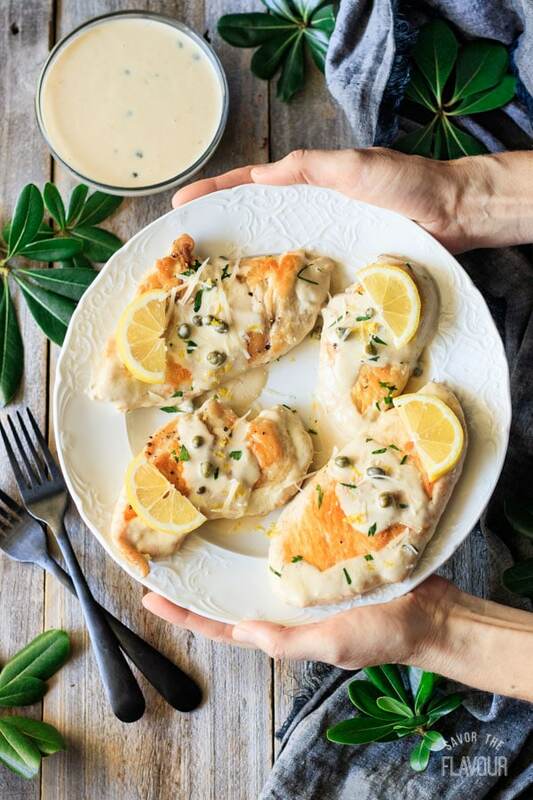 Share your thoughts on this creamy lemon chicken recipe by leaving a rating below. Rinse the two chicken breasts and pat them dry with a paper towel. Slice them in half horizontally with a sharp chef’s knife to get four thin chicken breasts. 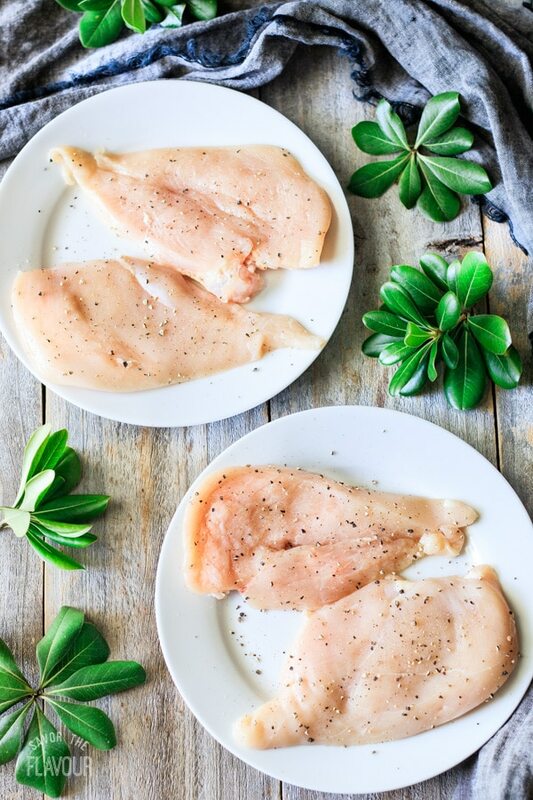 Lay a piece of plastic wrap over the chicken breast on the cutting board. Pound the chicken breast thin with the smooth side of a meat mallet. Start in the center and move outward, stopping when you have achieved your desired thickness. Place the chicken breasts on two plates, then sprinkle both sides of the chicken with salt and pepper. Heat the olive oil in a 10-inch skillet over medium high heat. Once the oil starts shimmering, place the chicken breasts in the skillet. Cook for 5 to 6 minutes per side, or until golden brown. Turn down the heat if the oil starts spitting. Put the cooked chicken on two clean plates. Sauté the garlic over medium high heat for one minute in the leftover oil from the chicken. Pour in the chicken stock to deglaze the pan and scrape the bottom to loosen any browned bits. Decrease the heat to medium and add the cream, Parmesan cheese, lemon juice, and capers. Sprinkle in salt and pepper and bring to a gentle simmer. Let it cook for a couple of minutes, whisking occasionally. 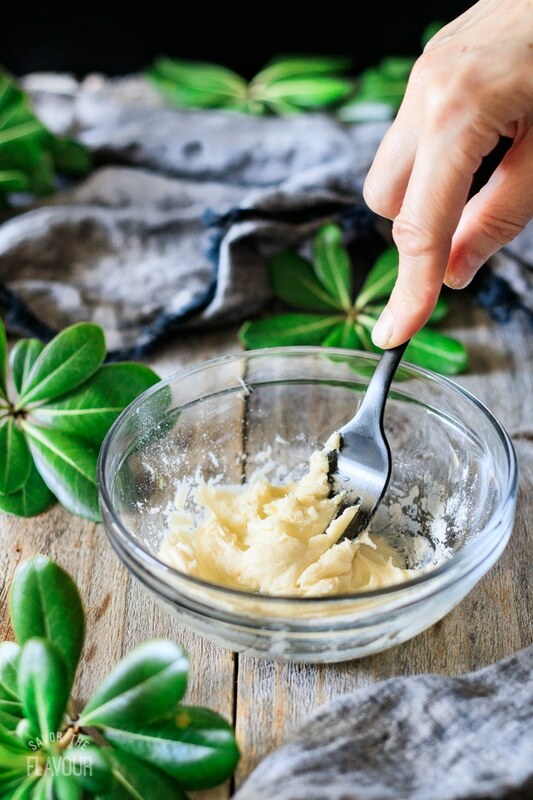 While the sauce is simmering, make the beurre manié by mixing equal parts softened butter and flour. Add one small spoonful of the butter paste to the sauce at a time, whisking until it’s incorporated. Keep adding it a spoonful at a time until the sauce is thickened. The beurre manié will add a nice shine and satiny texture to the sauce. Whisk in the lemon zest and any juices on the plates from the chicken. Add the chicken breasts to the sauce and cook over a medium low heat for 4 minutes so the chicken can heat through. 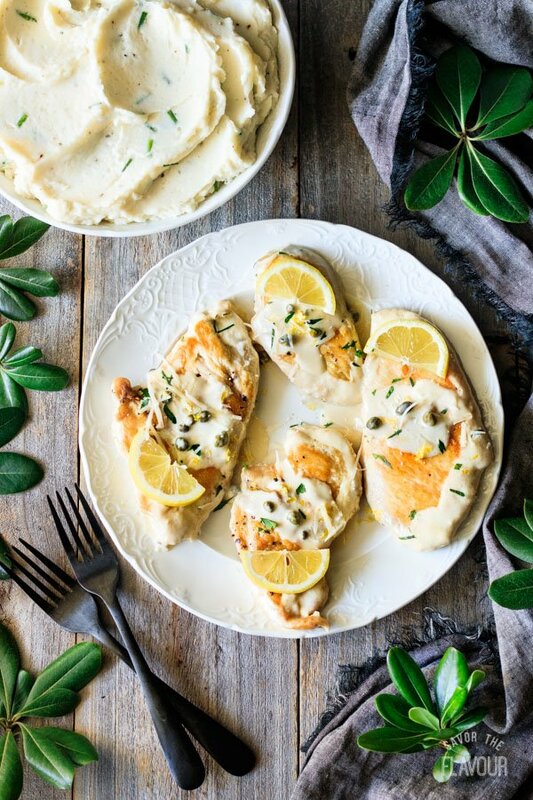 Place the chicken breasts on individual plates, and spoon the creamy lemon sauce over each one. Sprinkle with Parmesan cheese, parsley, and lemon slices. Serve immediately. To decrease the fat, use half and half instead of heavy whipping cream.